Việt Nam and Nepal got off to a slow start as both teams tried to establish dominance in midfield. After a 3-0 victory against Pakistan in the first match, Việt Nam got to dictate the pace of the game as they only needed a draw to proceed to the knock-out stage. As the game gathered momentum, Việt Nam showed their deadly skill in counter-attacking, especially with their fast wing play. They created several good openings in front of Nepal’s goalpost but the score remained 0-0. When there were no more than five minutes left in the first half, Vietnamese striker Nguyễn Anh Đức opened the scoreline with a header after he found himself unmarked in the box to receive a cross by Phan Văn Đức from the right during a quick counter-attack. Đức, 32, is the oldest player from the relatively young Vietnamese squad at this year’s ASIAD in Indonesia. The first half ended with Việt Nam holding a one-goal advantage. Coach Park Hang-seo made no adjustment to his squad as the referee blew his whistle to begin the second half. 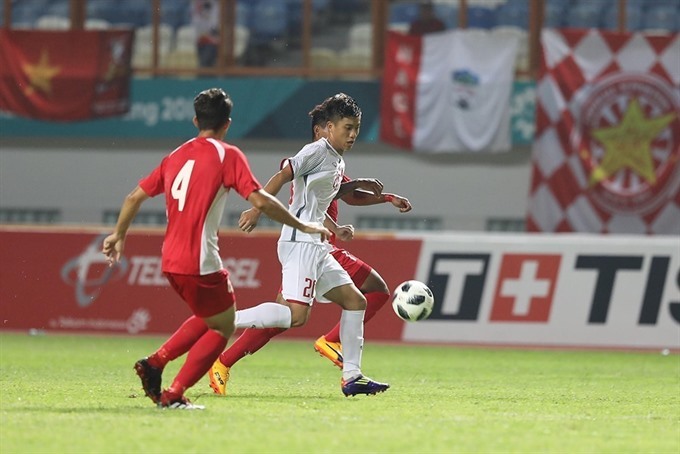 Việt Nam made clear that more than luck explained why they were the runner-up at the AFC U23 2018 Championship. Văn Đức doubled the Southeast Asian team’s lead in the 63rd minute of the game with a quick shoot in the box followed an excellent set up by Anh Đức, bringing the score to 2-0 for Việt Nam. After the first two matches, Viêt Nam and Japan are dead even with 6 points, 5 goals scored and zero goals conceded. The last match of group D between the two leaders will decide the final order of the group with Viêt Nam and Japan certain to proceed to the next stage.